Application Lifecycle Management [ALM] should ensure that an organization experiences an improved "business as usual" in the event of the implementation of new and/or changed functionality. Other (older) industries can give assurance, so the ICT industry should follow (soon?). This article will, I hope, give some next steps towards adulthood, by giving [ALM] directions how to prevent costly or even lethal disasters caused by bugs. 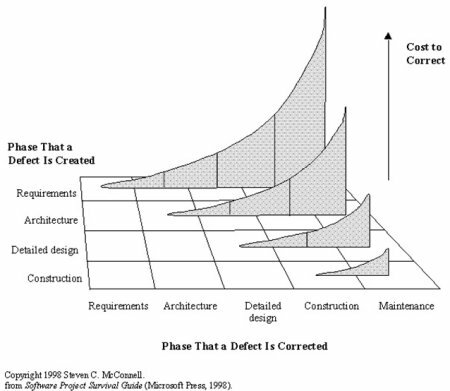 [ALM] must give assurance that developing and/or changing applications won't create disasters or extended disruptions! (I won't explain what software bugs can accomplish...). How to prevent a major disruption caused by the implementation of a new or changed application? Finding bugs as early as possible prevents changes in the software in the last phases of a project. Recently I participated in an (early) evaluation of an organisation, where the strategy of finding bugs as early as possible was implemented for the complete software engineering department by choosing the Quality Levels, tuning the Test Coverage of the successive test levels and introducing Learning Cycles. They had geat results! Finding Bugs AEAP (As Early As Possibly). Pillar 2: Bug Prevention by Testing Requirements and Use Cases. If software development is based on inaccurate requirements, then despite well written code, the software will be unsatisfactory. No doubt that the users do want to change the application before it is implemented. Changing an application in the last stages of a project will generate huge risks. Testing the requirements in the early stages of the project will minimize the changes on the application just before implementation. To give the testing of requirements a head start, I derived a checklist from the article "An Early Start to Testing: How to Test Requirements (Suzanne Robertson)"
Does each requirement have a quality measure that can be used to test whether any solution meets the requirement? Have we asked the stakeholders about conscious, unconscious and undreamed of requirements? Can you show that a modeling effort has taken place to discover the unconscious requirements? Can you demonstrate that brainstorming or similar efforts taken place to find the undreamed of requirements? After the requirements are tested they evolve in a functional model (for instance Use Cases) of the required application. To Test the Use Cases you can use the checklist I derived from the article: "Use Cases and Testing (Lee Copeland)"
Are all use case definition fields filled in? Do we really know what the words mean? Are all of the steps required to implement the use case included? Are all of the ways that things could go right identified and handled properly? Have all combinations been considered? Are all of the ways that things could go wrong identified and handled properly? Have all combinations been considered? Is the use case name the primary actor's goal expressed as an active verb phrase? Is the use case described at the appropriate black box/white box level? Are the preconditions mandatory? Can they be guaranteed by the system? Does the failed end condition protect the interests of all the stakeholders? Does the success end condition satisfy the interests of all the stakeholders? Does the main success scenario run from the trigger to the delivery of the success end condition? Is the sequence of action steps correct? Is each step stated in the present tense with an active verb as a goal that moves the process forward? Is it clear where and why alternate scenarios depart from the main scenario? Are design decisions (GUI, Database, �) omitted from the use case? Are the use case "generalization," "include," and "extend" relationships used to their fullest extent but used correctly? Can the system actually deliver the specified goals? Are all actors identified? Can you identify a specific person who will play the role of each actor? Is this everything that needs to be developed? Are all external system trigger conditions handled? Have all the words that suggest incompleteness ("some," "etc. "�) been removed? Is this what you really want? Is this all you really want? Is this more than you really want? When we build this system according to these use cases, will you be able to determine that we have succeeded? Can the system described actually be built? Do the use cases form a story that unfolds from highest to lowest levels? Is there a context-setting, highest-level use case at the outermost design scope for each primary actor? Are all the system's functional requirements reflected in the use cases? Are all the information sources listed? Do the use cases define all the functionality within the scope of the system and nothing outside the scope? Can we trace each use case back to its requirement(s)? Can we trace each use case forward to its class, sequence, and/or state-transition diagrams? We�ve just started on this topic, so I will keep you posted in later entries. Collaboration is a critical success factor in preventing a major disruption caused by the implementation of a new or changed application! All parties within [ALM] have to work together in creating good test coverage from the early until the last phases of the projects. I am sure that only when the Quality Levels, Learning Cycles and Metrics are in place, a good Business Continuity risk advice can be given to ensure that an organization experiences an improved "business as usual" in the event of the implementation of new and/or changed functionality. Analyzing and fixing a bug is, without doubt, a loss of time. And the later the bug is found, the greater are the losses. Finding bugs AEAP (As Early As Possibly) becomes more and more important, especially in the complex systems we make nowadays. So, let's join the knowledge of the Developer, the Tester and the Designer and tackle this challenge! Of course we can train the individual team members to test their own work....but, I know from my own experience, you can be blind for your own short comings. In the Application Life Cycle we should stimulate Developers, Testers and Designers to work together in the challenge to Find Bugs AEAP (As Early As Possibly). Join their knowledge and they will accomplish better systems in less time! For instance, let's look into the creating of Unit Test cases. The Unit Test mechanism is great, but if you don't know anything about test coverage it's almost impossible to get the advantages you want. 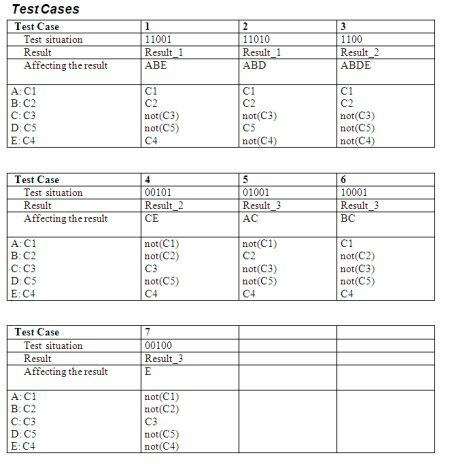 It is not easy to create the test cases for the test coverage MC/DC, especially if you want a minimum amount of test cases. Here the Tester comes into the play. With the help of TMap� test specification techniques, he/she creates the (logical) test cases. In this case the Tester delivers the Developer the following 7 (logical) MC/DC test cases. Depending on the risks, and with the help of Equivalence classes and Boundary value analysis, the physical test cases are derived. Now, the Developer can start building the test cases into his/her component. So, by joining their knowledge, the Developer and Tester did create, for this phase in the life cycle, the best test coverage to Find Bugs AEAP . The effect of collaboration can even be greater if the Unit Test cases, before implementing in the code, are reviewed by the Designer. Reviewing the test cases gives the Designer insight in the assumptions and interpretations of the Developer and Tester. Finding Bugs during this review is the ultimate AEAP!!! Creating these test cases manually is, even for experienced testers, pretty difficult. Within Sogeti we use a tool (I made) for this work. (The generation of the test cases of this example took me 5 minutes). Generalist Testers (Manual Testers) do like on-the-fly testing! It feels good to be creative and impulsive!! Let's react on the behavior of the system!........... Maybe it's not as efficient and/or effective as structured testing, but it is fun! ... what about "Non Reproducibility"? Too much fun brings also disadvantages. In complex systems, with many dependencies under the surface, on-the-fly testers aren't able (most of the time), to write reproducible bug reports. And that's a nightmare for the project manager. Non reproducible bugs are time consuming and expensive, so "on-the-fly testing" is banned out of the life of the Generalist Testers and replaced by structured test methods. Nowadays testers must work in formal structures, of course for efficient testing, but especially for generating reproducible bug reports. Writing an accurate bug report is NOT easy. It takes relatively much time, and even then they are not accurate enough, so developers may call for more information, or even worse, they close the bug report with the state "non reproducible". And believe me...That's not funny at all! I care because I want to improve the way testing is implemented in the complete application lifecycle [ALM], and besides that,...it's my job! I am process manager of the Managed Testing Services of Sogeti. If I see chances to improve our services, I go for it! The new test suite of Microsoft (codename Camano) is in my opinion a great chance for improvement. Instead of converting Generalist Testers into technical skilled testers, Microsoft has chosen to support the way Generalist Testers like to work: "Manual Testing"! Camano (part of Rosario) is the code name given to the Microsoft standalone testing suite for General Testers. Camano supports planning, creation and executing of manual test cases (CTP April 2008: for testing websites). See the blog entry of Randy Bergeron for some of the latest screen dumps. Regression testing: the whole script or part of the script. Export to Visual Studio for the creation of automated scripts (to be performed by technical skilled testers before releasing). And for bug reporting!! If a tester runs into a bug, the bug report contains not only all the configuration parameters, it also contains all the steps taken before the bug did occur! Combined with the possibility to capture the window, this support of bug reporting is very strong!! By combining Camano with the flexibility of our structured test approach TMap�, I can re-introduce on-the-fly testing in our test projects! Also, with Camano it is possible to have the fun of on-the-fly testing and still report reproducible bug reports. Combining Camano with TMap� makes it possible for us to do result driven test assignments (agreements with the project management concerning time, budget and/or test coverage) and still enjoy testing. To explain the test teams the balance between structured and on-the-fly testing and how to use Camano in the test project, I've written a fictitious case . The case specifications: Course Administration application. I'm sure the developers will like Camano. Especially if they find out that the bugs are reported accurately! Because: Fast bug fixing is almost as good as making no bugs at all! Today I read a nice article: "What's In the Box?" by Mary Altman. "The term is typically used to describe a device of which we know or care very little about its inner workings. The entire focus is on its input/output behavior�the result rather than the reasoning." "The way scientific and technical work is made invisible by its own success. ... Thus, paradoxically, the more science and technology succeed, the more opaque and obscure they become." "Most simply: it doesn't matter how it works. It only matters that it works." ...and what about the "black-box theory" in the software industry? I know that many colleague testers believe this conclusion is also valid in the software industry. So, when they organize an Acceptance Test, they rely completely on the testing target: "It only matters that it works". From the perspective of the end-user they are probably right....because the end-user is not interested in (and has no knowledge of) the inner workings. So many Acceptance Tests rely on a complete black-box strategy! I�m not one of them! I think an Acceptance Test must, besides the testing "that it works", find assurance that the inner workings are validated. I agree that it should not be tested in the Acceptance Test, but still it MATTER HOW IT WORKS!!! So how can we find assurance that it is tested? Is it possible for the software industry to give the Acceptance Test team the assurance the inner workings are validated and correct? On these questions I am convinced that the testing community can help the developers. I believe, much effort is already done in delivering software of good quality. But those efforts are hidden and not tuned into an efficient and effective process. Again: I think the testers can help! When testers and developers join together in describing all the quality measures (they already perform), it will be clear if enough measures are taken and/or what additional actions are needed. Chapter 7 of TMap� Next (Development Tests) gives for this inventory a small, but effective model. Compliance monitoring (how does the development process perform its internal monitoring). Together, developers and testers can fill in these four points of view. Combined with the quality measures of the requirements and design processes, this gives the Acceptance Test team the opportunity to get a "glass-box" impression how the inner workings are validated. So let's do it step by step: Creating a kind of glass-box by giving the Acceptance Testers the possibility to be a virtual witness of the development process would be a great first step! so today I made a more complex Activity Diagram (click on figure 1 to see it bigger). 2. Generate the TMap� Process Cycle Test cases (see the output ). Do you like it? I Do!! Test Case Design: Manually or Automated? We can test Verbal Diarrhea! Where are the Test Design Patterns? The Interface with Camano is working! What's next? Test cases directly generated from Activity Diagrams!